Studying Crisis and Emergency Management Using Global Cases of Best and Worst Practices. 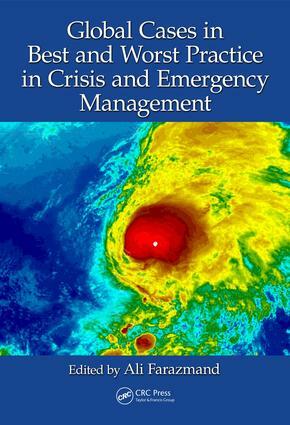 GLOBAL CASES OF CRISIS AND EMERGENCY MANAGEMENT: A MACRO POLICY PERSPECTIVE. Hurricane Katrina as a Global Case of Grand Failure: Lessons for Future Crisis and Emergency Management. Fukushima Nuclear Disaster and Ensuring Necessary Government Crisis and Risk Communication. Early Warning Success in Qinglong County, China, for the Magnitude 7.8 Tangshan Earthquake: Some Policy Lessons in Integrating Public Administration, Science, and Citizen Engagement. Emergency Management for Radiological Events: Lessons Learned from Three Mile Island, Chernobyl, and Fukushima Reactor Accidents. GLOBAL CASES OF BEST AND WORST PRACTICE IN CRISIS AND EMERGENCY MANAGEMENT. Hurricane Katrina and the Crisis of Emergency Management. Katrina: A Case of Man-Made and Natural Disaster. Managing at the Edge of Chaos: Lessons Learned from the 2006 Bam Earthquake in Iran. The United States: Emergency Management and the September 11, 2001 Terrorist Attacks. Wilma and Sandy: Lessons Learned from Public Servants. Lessons Learned from Managing Governance Crises in the Arab States. MITIGATION CAPACITY BUILDING FOR CRISIS AND EMERGENCY MANAGEMENT: LESSONS FROM GLOBAL CASES. Resilience Capacity Building for Global Crisis and Emergency Management. Building Disaster Resilience: The Communities Advancing Resilience Toolkit (CART). Learning from Transboundary Crises and Disasters: The 2010 Haiti Earthquake. Planning for Response to Weapons of Mass Destruction and CBRNE Events: A Local and Federal Partnership.